Ever wonder where the Trancendentalists went? Me neither. 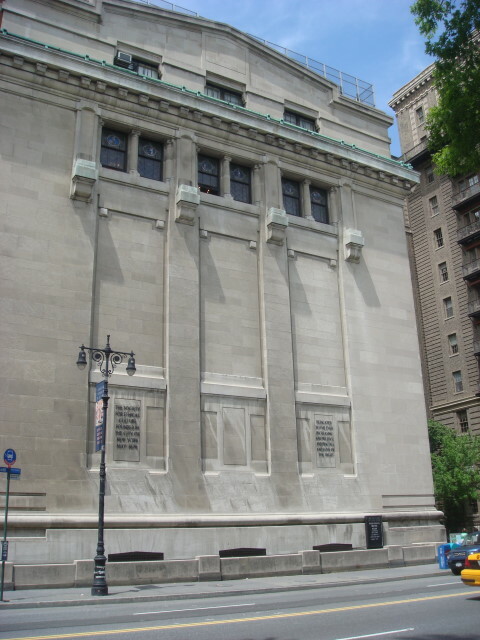 But it turns out that they are still around, this time in the guise of “The Society for Ethical Culture“. It’s been around since 1878. They’ve got a huge place right outside Central Park at Central Park West and 64th Street. Apparently, there’s a school right next to this place that is rated very, very highly. It is no longer associated with the Society, but that’s might be just a formality. 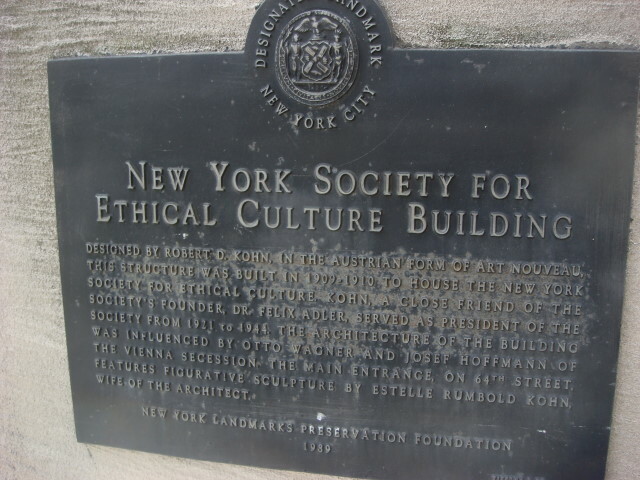 The school is named something like the Ethical Culture School, so I presume there is some crossover. From what I understand, they take on a distinctly religious sort of view, but without any bedrock of ultimate truth or of God. 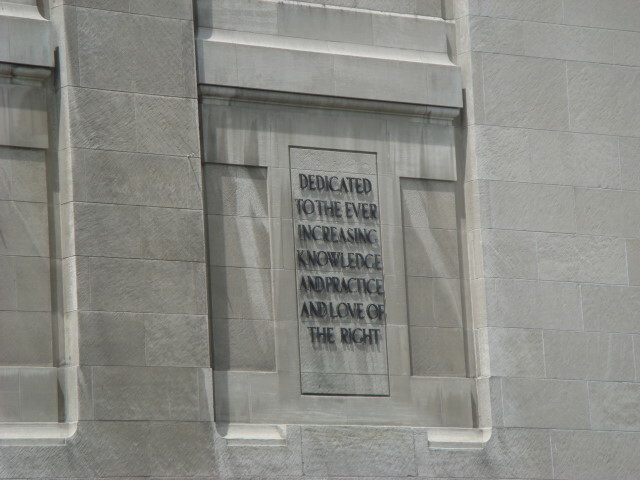 They just want, according to the plaque below, to practice and love doing the right. Of course, when I see something like this, my cantankerous nature says I need to find those organizations dedicated against ethical culture and hear their arguments, but that’s a rather thin viewpoint. The plaque below states that the building is designed in the Austrian form of Art Nouveau and was built in 1909. The designer was a close friend of the founder of the Society, Felix Adler, and he served as the Society’s president from 1921 to 1944. Not pictured (it was really out of focus) is a standard sort of Church bulletin board that posts the Sunday services at 11:15. At least according to the Wikipedia article, the Society has taken on a distinctly Christian look and feel in its attempts to reach out to the public. It takes no stand on the existence of God, but wants to act as a religious brotherhood to bring about a better culture and community. I can’t fault the goal. 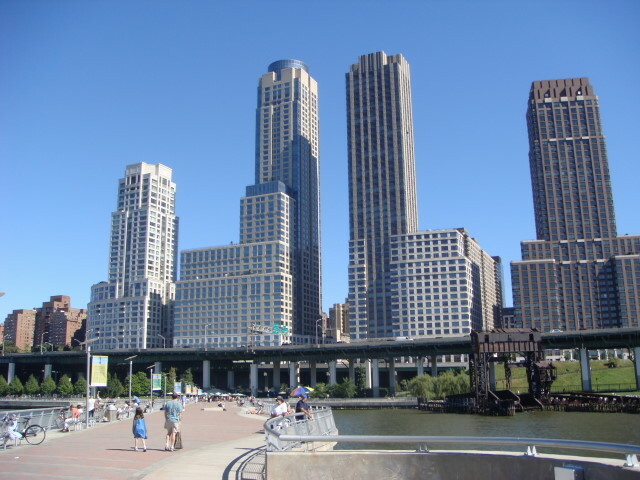 Back to my talking about my old home grounds in the Upper West Side. I really loved living at Trump Place. 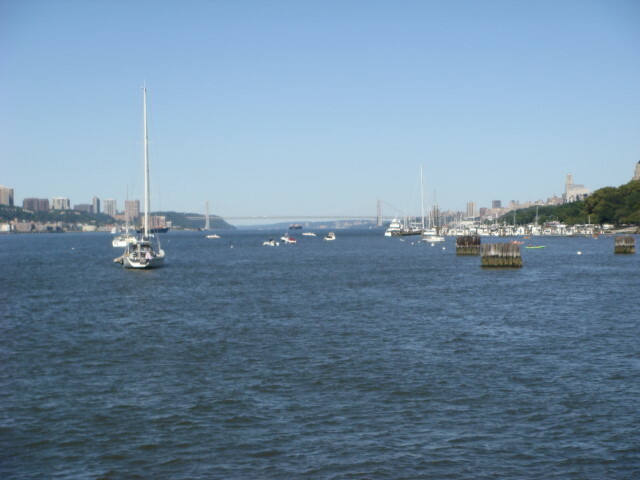 I stared out onto the Hudson River virtually every day. And this is from a guy who never opens his curtains nowadays. I don’t have the need for natural light that virtually everybody else has. But, when at Trump Place: I opened those curtains real wide! 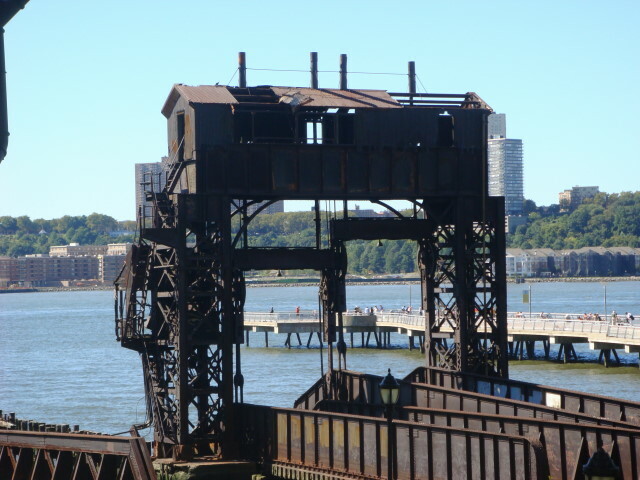 There were a variety of things I would watch from my old place: the Hudson, New Jersey, the pier, and an old wreck of a loading contraption. All three are still there. Yeah, there was a little marina just north of where I lived. That’s the pier behind it, of course. The whole area here had been piers and an old trainyard before Trump bought it and started the development. There are a variety of this sort of ruin up and down the riverfront, but this is the coolest looking of any I ever saw. And I had a perfect view from my place. When I decided to move from Trump (they raised the rent and I was hankering for my own place), I did look at a place behind Trump Place. 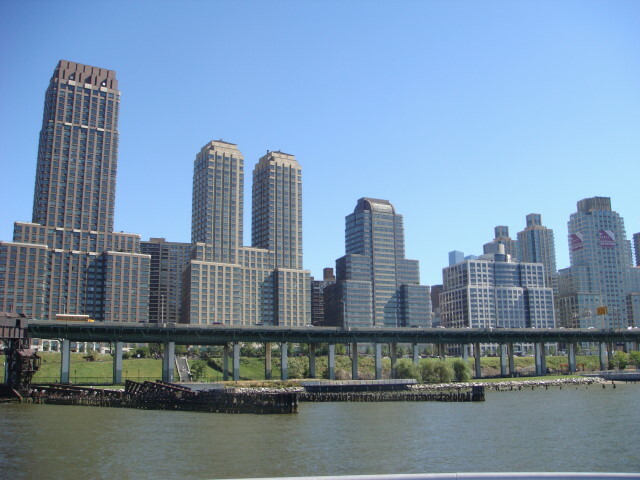 I was talking with one of the co-op/condo owners and started to hear a lot of vitriol against “The Donald” for having ruined their view by putting up the tall buildings where they before had only traintracks to look across before seeing the river. I have to admit I didn’t feel too much sympathy. They had made use of someone elses’ property and wanted to deny the owner the right to develop. And, incidentally, my understanding is that “The Donald” was only one participant in a very large group of others. He did get to stick his name on it to enhance its salability, though. Trump Place an enormous rental/condo set of building on the Hudson River named after…Donald Trump. I guess that most of the people who have heard of it are aware of it because it is associated in some way with his show “The Apprentice”. I’ve never seen the show but I heard it was associated with Trump Place in some way. And I used to live there. 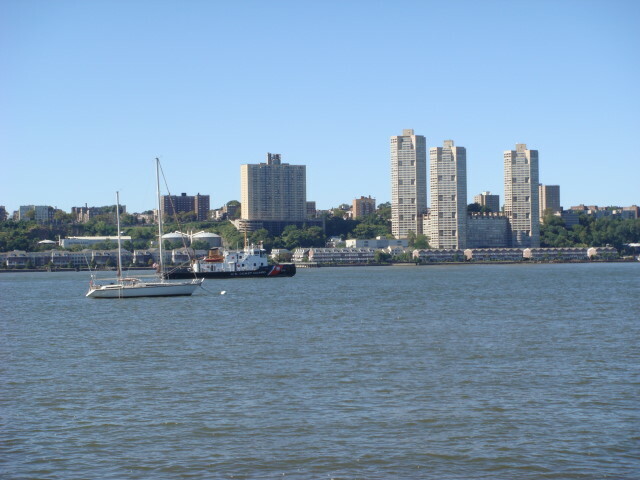 Trump Place is located at 69th and the Hudson River. Not quite right: the West Side Highway is between the buildings and the river, but the highway is elevated so there’s easy access to the river. The complex is enormous and goes a lot further north-south than 69th Street, but that’s where I was. 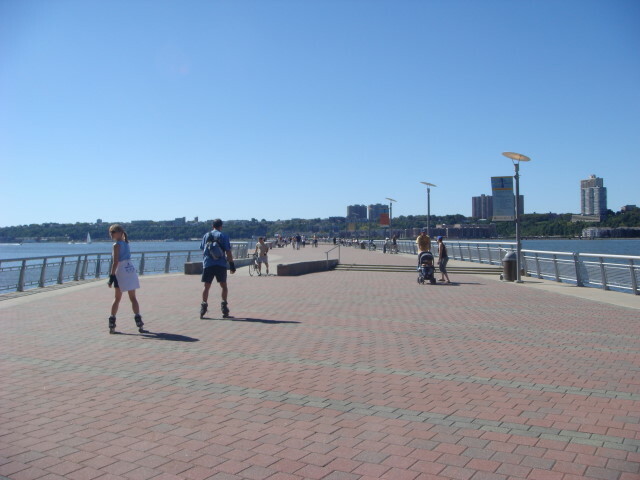 180 Riverside Blvd. Not “Riverside Drive” mind you: Boulevard. There are a series of buildings in the complex. Here’s a shot of them. Actually, it takes more than two shots to get it all. It goes on a little further, but they’re still building down there. You’ll notice one building appears in both photos. That’s my old place. I had the distinct pleasure of having a river view from the 17th floor. Spectacular. From what I understand, he didn’t own the buildings but did serve as the public face of the group doing the construction. As a tenant, I wanted for very little. This was a full-service kind of place. The rents were pretty hefty when I rented, but on par with other places in the city I looked at (sub-$3,000 per month including lease incentives). The staff was incredible. Absolutely incredible. If Donald is a proud man, that’s what he should be proud of: he hired some really good people. We’re talking doormen, concierges, porters (cleaning crew), security, and maintenance people. Wonderful. I never opened the door myself. I would be greeted by name in all but the crazyist times. They’d replace my lightbulbs for me (very high ceilings). And they’d bring their own lightbulbs. Everytime a food delivery was made, a security person would accompany the delivery. And stand well back during the delivery so there wasn’t a question of handing out two tips. Little things like that count for a lot. The laundry was open 24/7 with lots of washers and dryers. Like I said…it’s the little things. I’ve been planning to write a post with minimal pictures. I didn’t know it would be this one. I’ve wanted to write this sort-of-paean to Trump Place ever since I heard a Chicagoan say some less than favorable statements about Donald. I kicked myself for not chiming in “hey, he’s a great landlord”. There was only one time that I had any problems: when I left. It took me months to get my deposit back, but Trump Place was sold during the time that I was leaving so I didn’t really resent the confusion that was going on. And all the staff were always top notch, even the ones who were having a hard time tracking down my money. Like I said, Donald hires good people. Oh yeah, one day I ran into a woman whom I think was either Miss USA or Miss Universe. That’s a nice perk of living in such a place.